Guess who was in Singapore? Or the human camera as people like to call him. On the occasion of Singapore’s 50th birthday next year, this British savant, also an architectural illustrator was invited to work his magic, a.k.a sketch the Singapore panorama on a 4m x 1m sheet of paper over 5 days, from memory – which was made during an hour long helicopter ride viewing the skyline. This intensive drawing didn’t happen from the comfort of a private studio but live in front of an overwhelming audience of veteran fans – admirers who knew of his work and came to support, on the spot converts – those who read about him in the newspaper and came to douse their curiosity and lastly clueless saunterers – flittering shoppers (the event was held at the atrium of a shopping mall on orchard road) who came to check out what the fuss was about, lingered and took abundant photos. Stephen was propped up on a dais from 10am till 5pm, working nonchalantly with music plugged into his ears, while the crowd hung on every stroke that he pulled out from that brilliant mind of his. With hundreds of eyes watching anybody would deflect, but not this guy. He couldn’t have cared less – zilch performance anxiety. He was in the zone, doing his thing without a worry in the world. Right in front of the dais were a set of chairs where his sister was seated along with art school students who were sketching Stephen sketching Singapore. Photographers were tirelessly clicking the same static subjects from various angles – the students, Stephen, and the crowd which was huddled right outside the cordoned off area, containing the dais and the chairs. 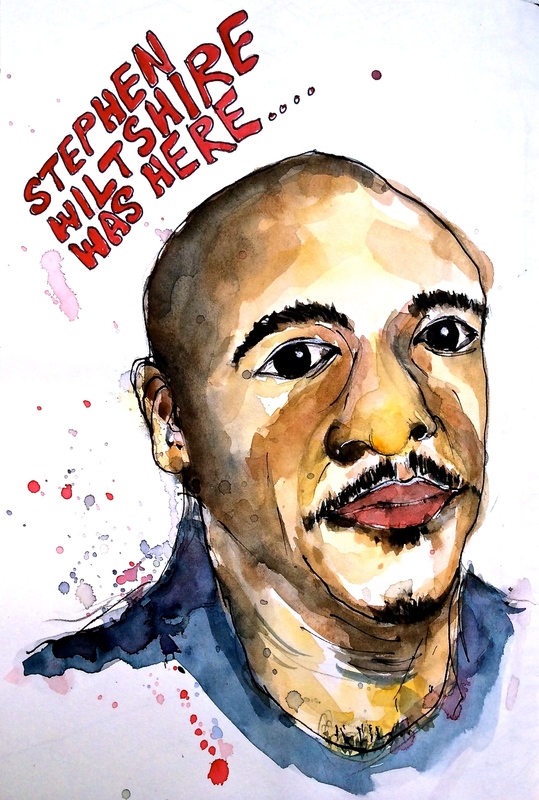 About quarter to 5, Stephen would check his watch and start wrapping up. He would then get off from his bar stool, fresh as a daisy, wave to the crowd that would start clapping and hooting, even to those cheering from the floors above and then sign autographs and smile for selfies. I am not good at battling crowds, so I didn’t indulge in either. Instead, I took pleasure in the second best – observing the ecstasy on the face of every admirer who had his or her brief moment with the world’s ‘human camera’. It was quite the thing! 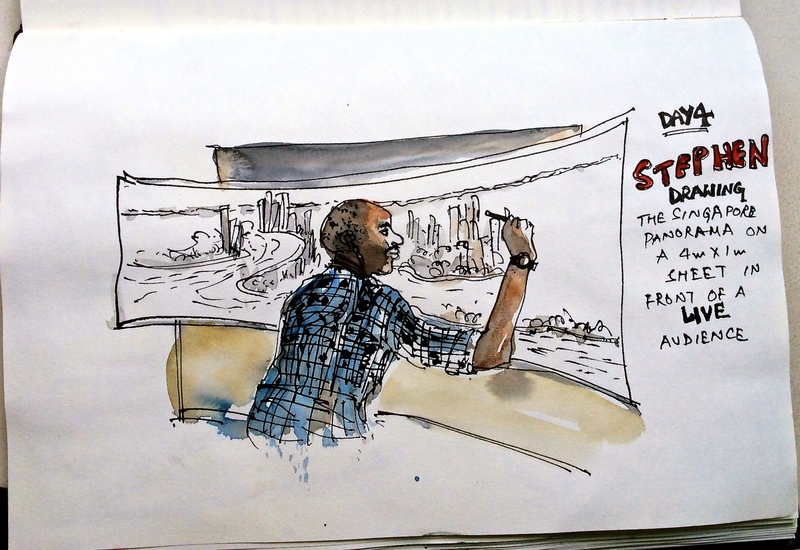 This entry was posted in Daily Vignettes and tagged 50th birthday, Architecture, British, camera, Human Camera, illustrator, live sketching, panorama, Singapore, sketching, Stephen, Stephen Wiltshire on July 24, 2014 by Somali Roy.